Working in a big tech company provides us with plenty of opportunities to design for new product launches. Read all about our latest event: the launch of Wix Code in NYC. Announcing a new major product is always a meaningful moment in a company’s life. I’ve been working at Wix for nearly seven years now, during which we launched new products and features every year. The ones that are most exciting are those that mark a big change in the company – like the time we moved our editor from Flash to HTML. 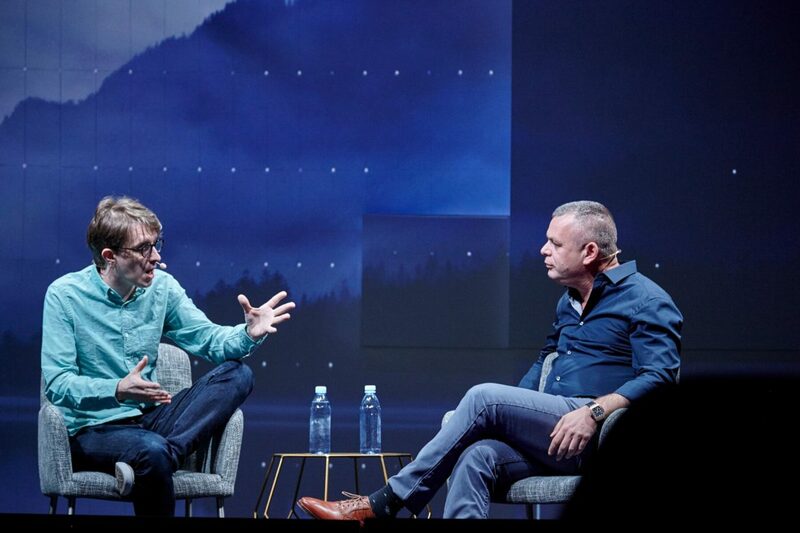 These moments are special because all the departments in the company work together towards one single goal, which creates a unique and collaborative atmosphere in our offices all over the world. 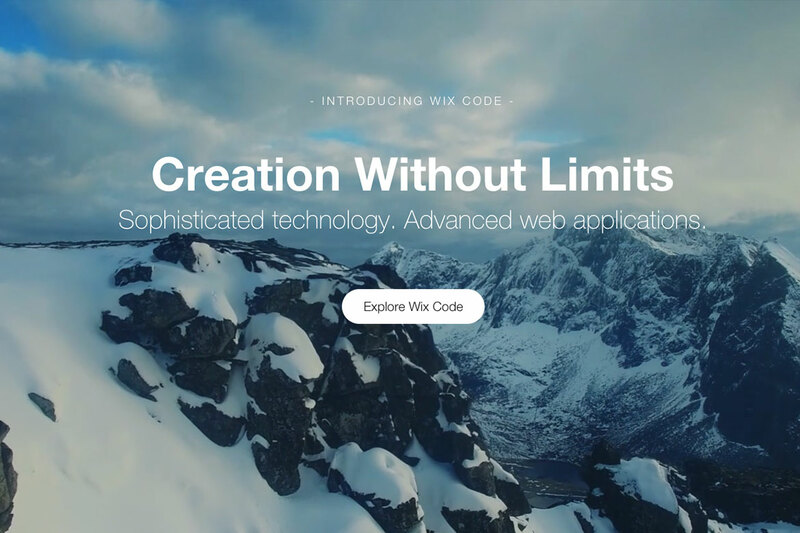 This August, we launched Wix Code – the latest and greatest of our company’s developments. For the day of the launch in NYC, we hosted a special event where we wanted the crowd of invitees to feel that special atmosphere for themselves. We wanted them to feel as engaged, excited and psyched as we felt. So how do you design to impress? How do you create a product launch event that creates a maximum effect? Here are six tips from Wix’s leading designers of the Wix Code launch. Videos are perfect for a launch event – the combination of visuals, animations, and music can bring an event and product to life in the most exciting way. Even the most “boring” product becomes breathtaking when you add great design, animation, and a matching beat. Remember to treat this format more as a showreel rather than a product-focused video. Imagine you’re working on a whole show that should act as the main performance for the event. Try to push the boundaries of the elements and your own brand guidelines – this is the time to go wild. Use complex and interesting animations. For the Wix Code launch, even the mouse cursor movement got its own personality, which is different from the minimalistic motion we usually use. One of the great advantages of working with an actual space is you can incorporate all of the senses to magnify the experience. Carefully choose the music that plays on your videos. If you can, use original material. Working with a musician or composer is so much different (and better) than finding music and trying to blend it in with the video. When used correctly, music can help in structuring a long and complex video. For the Wix Code launch, we chose a different beat for each segment of the video, creating an element the viewer could recognize and rely on throughout the show. 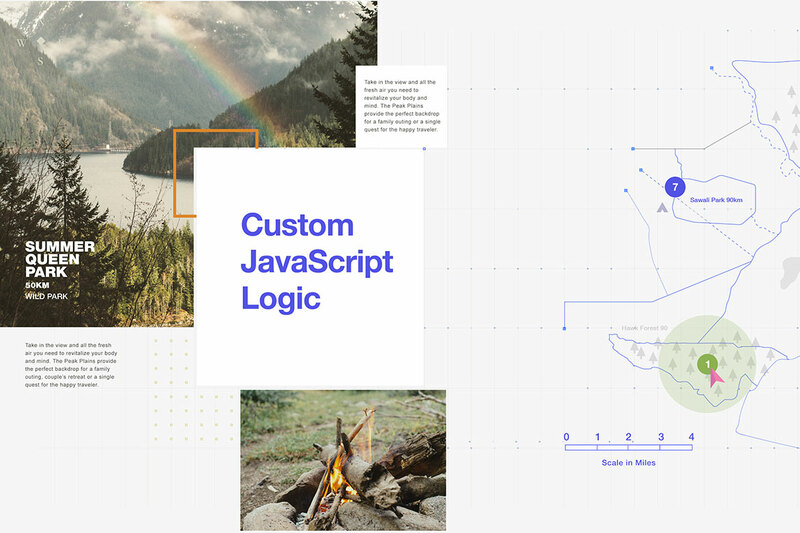 Adapt the online “Pixel-Perfect” method to the offline world, so that each element will be executed perfectly. Our attention to the smallest details shouldn’t change just because the format has changed. Another method we all use in web design, which can also be incorporated into the event space design, is the way we approach the composition. When we’re creating a composition we usually try to lead the viewer to a specific point, the most important one on the screen. We do that by creating the right hierarchy between all of the elements. When designing a space and its interior, apply that same way of thinking. For the Wix Code launch, we designed everything in a way that made the stage and screen the center of attention, and everything else – demo stations, the bar, etc. – were supporting elements that added interest, but never stole the show. Massive churches, huge music halls, oversized art that takes up a whole wall in a museum – these are all great examples of how a big format can be such a meaningful part of an experience. 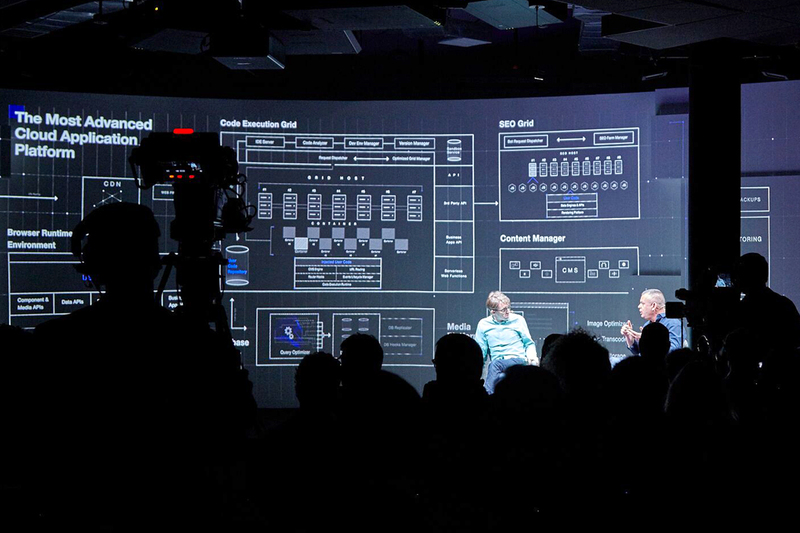 In order to create a dramatic ambiance for the Wix Code launch, we built a huge stage and a 3D screen that stretched throughout the entire space, from top to bottom. We had the opportunity to show the presentation in this oversized approach, which added a sense of innovation and boundary-pushing. There are many ways to use enlarged design elements for that same enhanced feeling – huge typography on the walls, enlarged logos, 3D objects that protrude from the screen – these all can help in adding drama and make it easier to design the whole space. Launching a new product usually involves the need to present your technological innovation, as well as your professionalism. We wanted our format to emphasize these aspects as well – which is how we came up with the idea to use “video mapping”. 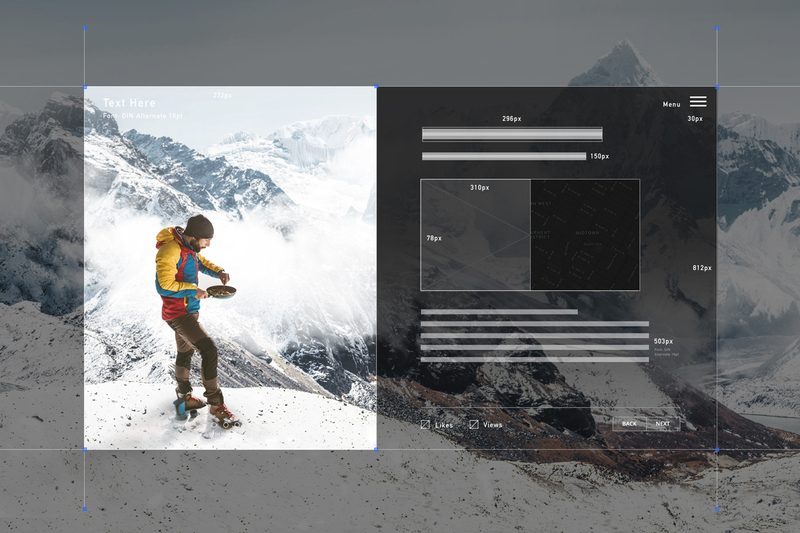 It’s a super cool technique that lets you project a video, image or graphic on a “masked” area of your choice, so your screening area is not a fixed regular square, but rather anything you want. An important thing to consider is the images or media you choose. Just like choosing your music, it’s best to use original materials that were made especially for this event. For the Wix Code launch, we received original footage from artists and worked with outstanding 3D designers to create the best original materials. One last tip, which is relevant and imperative for any large-scale project – maintain consistency. When you work with so many teams, designers and other stakeholders, it’s important to make sure everybody uses the chosen design and graphic guidelines in the right manner, keeping everything consistent and coherent. For the Wix Code project, we had a team of designers working on a few design options for both the product and the launch event. After a thorough process, we had a chosen design from which the entire guidelines were built from and developed further. Each team had the opportunity to take that design and use it, expand it and tailor it according to their own needs and formats. But the consistency throughout the whole process and the different elements was carefully checked and looked after the entire time. This piece was made possible with help of Ella Moscovitz, Eyal Sebbag, Orly Kiryati, Guy Levin, Lior Dahan, Amit Asulin and Zachi Massas.